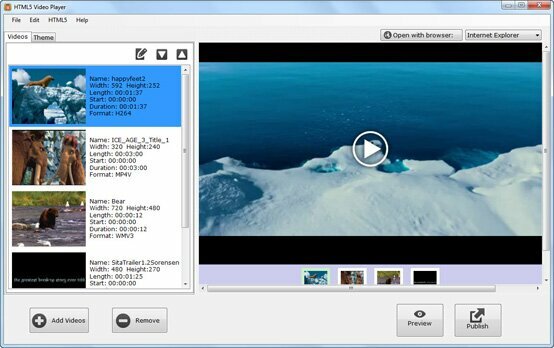 Can the HTML5 tool convert my videos to OGG Theora format? To solve the HTML5 compatibility issue among different web browsers, you will need different copies of the same video in OGG (Theora), WebM or MP4(H.264) formats. The demand for the easiest way to convert video to OGG theora is increasing as may users may not be very familiar with this video type, codec and how to convert it. Socusoft HTML5 Video Player is the all-in-on HTML5 video solution you will need that can definitely serve for your HTML5 video converting needs. It provides you the easiest way to convert videos to OGG Theora. Other than that, it offers video editing functions, you do not need to purchase an additional software for OGG Theora video editing. What’s more, it can generate stylish video player to wrap the videos, you can put the videos online with nice looking players. If you have many videos want to convert to OGG Theora format. You may need the batch conversion feature. Our HTML5 video app supports batch encoding to the OGG Theora videos. You can easily convert multiple videos in the same process.